100% carbon fibre 25ft waterfed pole, extremely lightweight and durable. These poles are incredibly rigid. 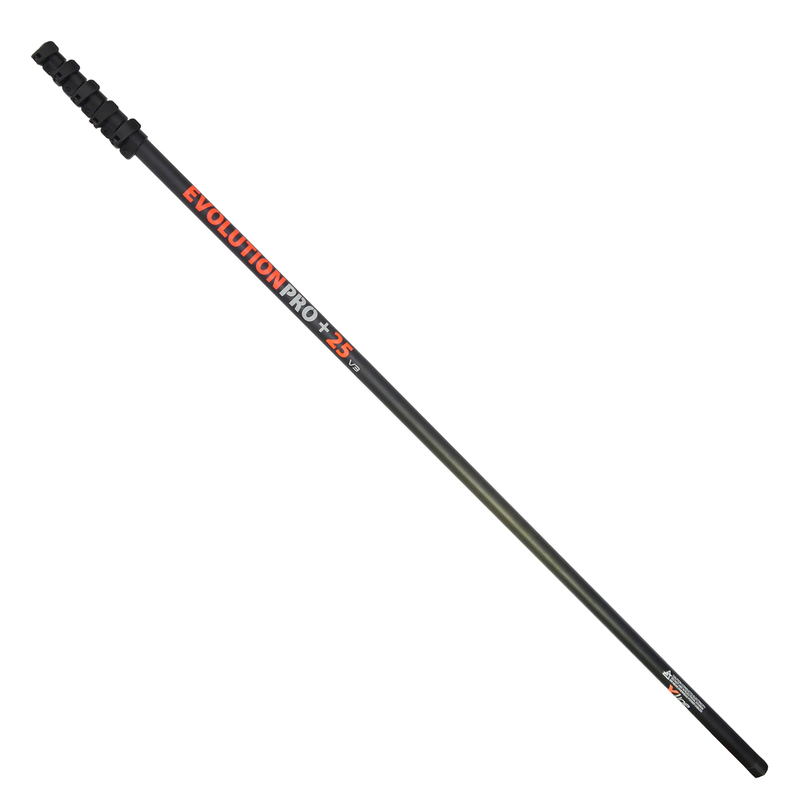 The Evolution Pro + range of water fed poles are our high end professional water fed poles. Thses poles are constructed from 100% carbon fibre making them unbelievably rigid, lightweight and very strong. These poles are suitable for all types of cleaning such as domestic, commercial and industrial. Available in 7 different sizes from 18 to 72ft. Upon opening the package, the first thing you notice is just how light this pole is. As you extend it, the fact it keeps it's rigidity despite it's light weight is impressive. There are lots of really impressive design features. My personal favourite is the moulded aluminium base cap, which is indented to allow the pole hose to nestle in the groove when you store the pole in your van. I've lost count of the number of times I've sprung a leak in pole hose, particularly during the winter - because pole hose rubs time and again against the base cap. With the Evolution Carbon Fibre Pole, that will be a thing of the past. The clamps look secure and don't look like they will suffer from spinning as the pole wears in. Overall, I'd recommend this pole wholeheartedly to anyone that's in the market for a high-end specification WFPole.